"[I'm learning that] I need to take the edge off a little bit and just get back to the pure love of running ... In some ways, in order to best compete at the highest level I can, I have to be willing to open up my hands and let go of having to win the Boston Marathon." - Ryan Hall during a teleconference Tuesday where he announced he will be running the 2010 Bank of America Chicago Marathon. 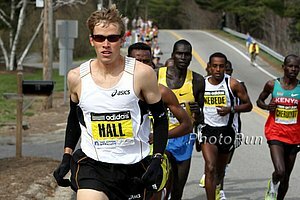 Hall is already looking forward to the flat course in Chicago while the hills of Boston are 2 weeks away. WHO was the best Steeplechaser of the decade of the 70s? 17-Year-Old Alabma Freshman Kirani James Runs 45.02 To Break 32-Year-Old School Record At CARIFTA Games It's going to be an unbelievable year in the 400 in the SEC. *UF 4 x 400 3:00.31!!!!! *Jeff Demps Runs 10.11 At Pepsi Florida Relays Christian Taylor, best known as a long and triple jumper, showed what an unbelievable athlete he is by running 45.55 to win the open 400. Francena McCorory and Shana Cox set world leads in the 200 and 400. In distance races, Julius Bor nipped Ryan Foster in the 1,500, both running 3:41. *Penn State 4 x 800 Runs 7:18 More amazing is that it's only the 7th-best time in school history. *Boards: Will Chelsey Sveinsson be a bigger phenom than Jordan Hasay? *UTEP Olympic Medalist Blessing Okagbare Wins Texas Relays LJ In Record 22'7"
*Boards: Hall to run Chicago The next question appears to be: Meb or Geb or both for New York? Should find out within next 12 hours. *Watch The 2010 NYC Marathon Lottery Live At 12 Noon EST Wednesday The NYRR video website is down and the sound is super slowmo, so clearly the NYRR or Flotrack screwed up. However, they are using Livestream.com a free streaming service so you can watch it here as the livestream.com site can handle the load (4000 people watching as of now 12:15 eastern). Note to anyone who wants to stream something these days: Livestream.com and Ustream.tv provide free streaming and can handle hundreds of thousands of simultaneous streams. Your own website may not be able to. 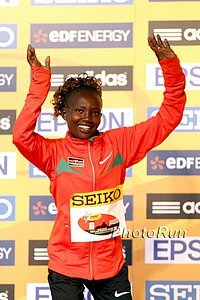 Mary Keitany To Attack Rarely Run 25k World Record In BIG 25 Berlin The world record is 1:22:13 set en route to the 2005 Berlin Marathon by Mizuki Noguchi. Keitany was the road racer of the year in '09. Astedou Tsefay Runs Course Record 27:30 To Win In Morocco If you can find stats on Tsefay, please contact us. Esquire Runs Lengthy Feature On Usain Bolt Titled: Mutant Coach Glen Mills says the #1 thing he has done for Bolt is reduce his training load and tailor his exercises to help overcome his scoliosis. *Bolt/Gay/Powell In Brussells Will Be Most Expensive 100m In History Despite the IAAF apparently being close to financial disaster, it costs too much to have the best in the sport race each other more than once a year. 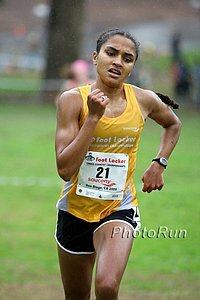 Lineth Chepkirui Runs One Of The Greatest Female Road Races Of All Time At CCC Lineth Chepkurui followed her 5th place at World XC with a stellar 30:45 to win the women's race by over a quarter mile and finish behind only 15 men. *Crescent City Classic: Results Tilahun Regassa got the men's win despite injuring his Achilles in the first mile, while Antonio Vega was 7th and top American. Amazing Story: Yobes Ondieki's Protégé Wins Safaricom Nakuru Half Marathon In 59:53 Almost 17 years ago, Ondieki became the first man to record a sub-27:00 10,000m and has been coaching Peter Kariuki for 6 months.